One of my most memorable consulting assignments involved the solution to a productivity problem at an injections moulding facility. The plant had 14 injection moulding machines producing precision nylon parts of high quality for the Australian market, writes John Blakemore. THE CEO and the Plant Manager were planning to double production by investing approximately $20 million in 14 new machines. My contract was to improve the performance of the existing plant. After observing and measuring the machines, and collecting the current management data that the management used to monitor and measure the plant performance, I trained the operators in basic data collection and started the teams re-measuring the machine performance. The results are shown in the figure below. The defect rate was approximately 15% in weeks 1 to 5. In week 6 the defect rate climbed to 45%. This was a result of the new measurement system that was introduced to more accurately measure machine performance. 176 good parts per cycle was producing far less. Up to 80 plus cavities were blocked off in some dies. The result of this that instead of producing 176 parts per cycle the machine was producing, say, less than 100 parts per cycle. The information fed to the management was that the defect rate was less than 0.99% when in fact if the cavities were not blocked off the defect rate would have been approximately 50 per cent. The solution was to measure the blocked cavity as a defect. The focus was then to fix the die and produce 176 good parts per cycle. The productivity could then be doubled. What a revelation! When this data was taken to senior management, the initial; reaction was disbelief. Management had no idea that this was happening. Why didn’t the senior management know what was really going on? Did the plant need another 14 machines? Over the next 34 weeks, the teams worked to repair the dies and improve the general maintenance of the machines. 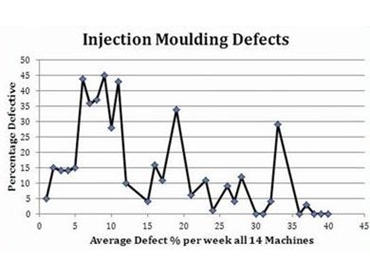 Aside from a few minor problems the defect rate continued to fall to almost zero after 40 weeks. We were heading towards a six sigma performance. At the end of this period, the company was confident enough to consider exporting to Singapore, USA and Japan. Five weeks after the first container was sent to Japan - just before Christmas - the company received a worrying message: the Japanese customer was sending back defective parts. There was panic in the company. We all anticipated that container loads would be returned. Instead the small parts arrived in an envelope. In all, 20 parts from the whole container. The customer believed that we could benefit from an analysis of the parts returned and we certainly did. It is easy to criticise management in this case. Western culture has taught us many bad habits. The Japanese have a solution, it is genchi genbutsu… “go and see for yourself”. When studying any system it is important to go directly to the source. Simple and costly errors can be made if there is a supply chain of information involved and the data at the source is not collected and analysed, and this was the case for the client above. It is important that the communication channel remains open and there is an honest and trusting environment between operators and managers. Another client of mine had a serious measurement problem when they thought they were measuring the real demand to be placed on a system but instead they changed the real demand into an error-laden forecasting system, with input from the marketing department based on what they thought they could sell, and this resulted in massive overproduction and waste. There is a cardinal rule for manufacturing businesses….make only what you can sell with the correct quality cost and delivery. Any non-demand input into a manufacturing plan will increase the variation and produce a less desirable fit between demand and production and hence will result in excess finished goods inventory and hence more working capital.